I recently bought a heavy wooden frame with an interesting shape at an estate sale that I wanted to turn into a framed cork board. Ballard Designs has some beautiful ones for sale, but one of a similar size to the frame I bought costs $100...I wanted mine to be cheaper than that! I started by taking the floral picture out of the frame. It was decoupaged over a thin MDF board, which was a perfect surface for attaching the cork. I sanded the frame to roughen up the wood. I also used my hammer to distress the wood a bit.....I wanted the frame to look a little worn. Since I wanted a chippy paint look, I rubbed areas where I wanted the paint to come off with a little clear candle wax. You need to add a little more wax than you think you need in order for the paint to chip off nicely. I painted the frame with two coats of white chalk paint, letting it dry for about two hours in between. The chalk paint leaves a beautiful textured finish to what you're painting. 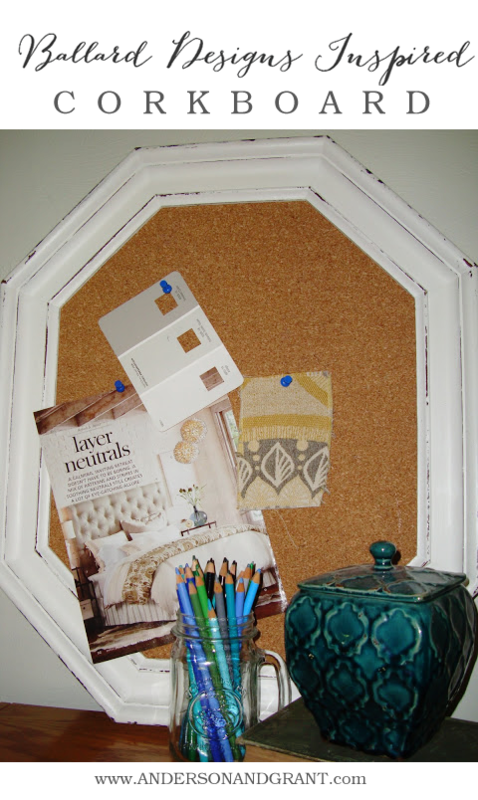 If you don't want to invest in chalk paint, you can make it yourself with Plaster of Paris. Click here for the DIY Chalk Paint Recipe and tips for the best painted finish. Since making this project, I've also grown to love Fusion Mineral Paint for projects like this. When the paint was dry, I used a medium grit sand paper on the edges where the wax had been rubbed. To protect the wood, I used Paste Furniture Wax applied with a wax brush (or clean rag) to cover the frame. It does an amazing job sealing wood painted with chalk paint and doesn't yellow over time like a varnish or polyurethane can. 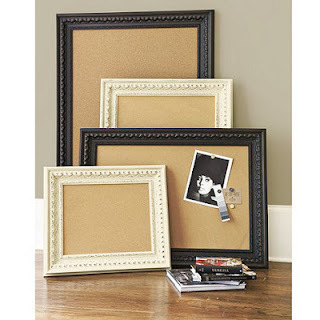 Corkboard can be purchased in a roll online or in craft stores. I laid the cork board out, coated my MDF board with Mod Podge , and then pressed it down onto the cork. Using an x-acto knife, I cut the cork along the edge of the board. Since the cork is thin, I added a second layer of cork in order to make it thick enough for pushpins to go into. The cork board went back into the frame and the project was done. What do you think? I personally like it better than the Ballard Designs version because it has such a different shaped frame. Plus the entire project cost only about $5. Who can beat that?!? !